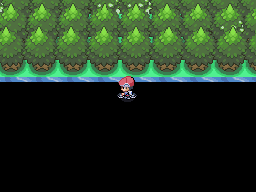 Interactive Map Location of Battle Frontier in [[Torren. 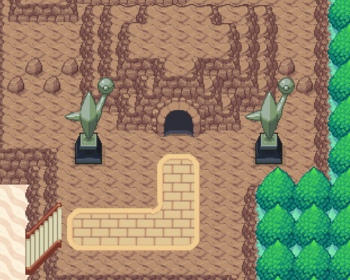 The Battle Frontier is a post game location in Roggan Town which can be accessed in a cave to the right via Rock Climb. A challenge in which you select three Pokémon to fight seven 3v3 battles in a row, healing after each round. Rewards are given at the end of each seven-round run. A challenge in which you select three Pokémon to fight seven 3v3 battles in a row, healing after each round. Unlike the Battle Tower, this challenge does not allow switching and battles are organized into three-turn "face-offs." If neither Pokémon has been knocked out at the end, the judge will select a winner based on three criteria and the losing Pokémon will leave battle. Warning: This facility is extremely bugged. If you enter, you will have to soft reset the game to leave. A challenge in which you select three rental Pokémon from a randomized pool of six at the start. You will fight seven 3v3 battles in a row, and you will be allowed to trade one of your Pokémon for a defeated opponent's Pokémon after every round. A tournament with powerful trainers from different regions, such as Gym leaders and Champions. You receive ranks after a certain number of wins. If you lose, you will be dropped down to the number of wins needed to achieve the last rank you received. Rewards are given after completing a tournament based on your own current rank. Completing this facility for the first time will give you the Tube Pass, which will allow you to face the Tube Challenge. Warning: This facility is bugged currently and it will not give rewards or allow you to proceed past the Novice rank. Also, obtaining the Tube Pass may require multiple tries due to bugs. A challenge that involves battling 13 trainers - these being around Level 83-85. The Tube Pass is required to start this challenge. At the end of the challenge you'll face the Arena Master. Whilst the Arena Master only has one Pokemon, be aware that it is Lv 120. You are able to leave and heal up between each battle and continue later if needed. A lady in the house under the Battle Arena offers to sell type-boosting items. A lady in the 1st house left of the Battle Tower offer to sell gems. A guy in the 2nd house left of the Battle Tower offer to sell competitive items. A guy in the house by the Tube Challenge offer to sell higher-tier items. A lady in the Challenge Championship tower offers to sell competitive berries. Another lady in the Challenge Championship tower offers to sell super-effective berries. A Hiker will offer to trade his Delta Plusle for a regular Minun. A Hiker will offer to trade his Delta Minun for a regular Plusle. Delta Golett is available as a reward for completing the Tube Challenge.